� � Once upon a time there was a beautiful and kind tuxedo-style cat named Modigliani. Modi, as he was often called, was named after a famous painter and sculpture and although Modi the cat couldn�t himself paint (he lacked prehensile thumbs, of course) he, too, considered himself an artist in all he did. His fur was black and silky and so shiny that in certain light it looked blue. He had big eyes, as round as soup bowls, and he always kept his whiskers free of crumbs. Even despite his weight problem, which he insisted was glandular, he was largely considered one of the most attractive cats in both California and Colorado. � � The three most important things in life to Modi were love (giving and getting) food, and sleep. These are listed in no particular order. He was smart and patient and, like many cats, was prone to spending extended periods of time staring at a spot on the wall or out the window. Often during these meditative times he would be interrupted by his best friend, Gauguin. Now, the stealthy reader may know that the artist Modigliani was actually best friends with the artist Pablo Picasso, not Paul Gauguin. The kind reader will allow this suspension of reality. � � Gauguin the cat had many pleasing attributes himself. He, too, was quite attractive, often being referred to as orange marmalade. He was long and sleek and had a metabolism that any 30-year-old human woman would envy. He never seemed to run out of energy. And, while Gauguin wasn�t necessarily as intelligent as Modi, he was just as sincere. � � As April began to blossom in Santa Monica, the two cats felt the deep gurgling urge to GO OUTSIDE quell within them. The thing is, even if they could have verbalized their desire in more than meows and purrs, they wouldn�t have known what to say for they were the most woefully pitied type of felines�they were housecats and they were fixed. They longed to be on THE OUTSIDE to DO SOMETHING�though they didn�t know exactly what they�d do once they got out there. � � Still, they tried. The weather warmed and the pungent scent of the Pacific made its way 16 blocks inland. Modi and Gauguin would raise their noses high into the air and take turns staring deeply through the screen door and at one another. This practice was not lost on their HUMAN, who did her best to make sure that fresh air was always circulating around the apartment. As the cats watched the flowers bloom and the birds perch on the apartment across the courtyard from theirs, they made a plan. They would escape. They would get to THE OUTSIDE and they would DO SOMETHING. � � As different as Modi and Gauguin were in their physical attributes, so were they in their plans to escape the confines of the oppressive one-bedroom apartment. Gauguin would make his way to the farthest corner of the bathroom, which allowed him a straight shot to the screen door. He�d cool his paws on the porcelain as his back side twitched in anticipation. Then, with sudden fervor and determination, he�d launch himself through the bathroom doorframe, across the living room, and then into the air to stick himself onto the screen door. There he�d stay, crying and aghast at the fact that he was not on THE OUTSIDE. Modi, his eyes wide and his back arched, would stare at the silly young cat and silently chide him. Though Modi loved Gauguin dearly, he was often relieved that no other cats were around to witness the youngster�s silly antics. Modi was much more crafty in his attempts to escape. He understood that a screen door was impenetrable to a cat (again, the lack of prehensile thumbs). He would have to take advantage of his own stealth and his HUMAN�S unassuming nature. � � One of the first things Modi noticed about his HUMAN was something they had in common: a fondness for routine. But, while Modi�s routine largely centered on following sun splotches around the apartment, the HUMAN�S routine seemed to move from bed, to coffee pot, to small box with pictures, to coffee pot, to large box with pictures, to coffee pot, and back to bed. Discouraging, indeed, but his HUMAN did have a tendency to go OUTSIDE from time to time. Modi learned the signs: SHOES, KEYS, and the inevitable false promise of, �I�ll be back in five minutes.� This, she would say, every time she left and, as such, neither cat had any concept of time. (Of course, this is acceptable for cats so the reader need not despair.) So when THE HUMAN would perform the appropriate actions, Modi would hide behind the couch and crouch in preparation. 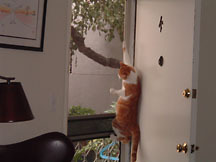 As soon as THE HUMAN pried open the screen door, Modi would dart toward the door, his bulk immediately transformed into toned muscle designed for this one purpose: to DO SOMETHING on THE OUTSIDE. Most times, however, THE HUMAN proved to be just a bit wiser than she appeared and Modi�s escape probed unsuccessful. She�s stick out one of her (only) two legs or slam that door closed just as quickly as she opened it. Clearly a better plan was in order and Modi soon realized that the best chance of escape centered on him and Gauguin combining forces. � � Will Modi and Gauguin escape the apartment and get to THE OUTSIDE? Will they figure out what to DO once they get there? Does THE HUMAN have any tricks up her sleeve to thwart their plans? Find out next time!